In his time, Geoffrey Rush has played troubled pianist David Helfgott, Les Misérables‘ obsessive police inspector Javert, the Marquis de Sade, Leon Trotsky, Peter Sellers and the Pirates of the Caribbean franchise’s vicious buccaneer Barbossa, among other vivid characters. In contrast, the most remarkable trait of Hans Hubermann, the character he plays in the Nazi era drama The Book Thief is that he is so very unremarkable, a quality Rush finds very attractive. “I loved the matter-of-fact ordinariness of Hans Hubermann, just for me as an actor in terms of things I’ve played before,” he says during a recent visit to San Francisco. “The needle’s probably gone to the extreme end of the spectrum of eccentric or colorful, bold characterizations. It appealed to me to play this man who seemingly on the outside was ordinary to the point of actually being quite boring. 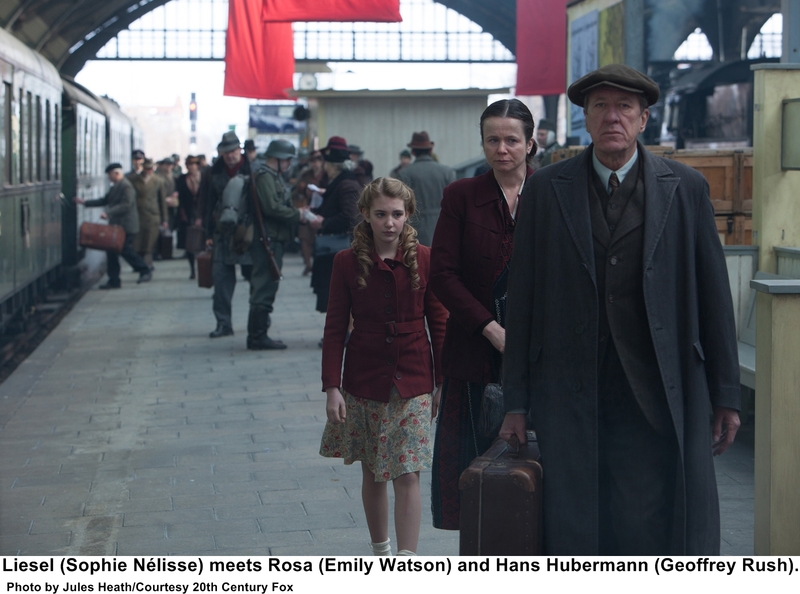 In Brian Percival’s adaptation of Markus Zusak’s bestselling novel, Hans is a patient, good-natured man who bears his shrewish wife Rosa’s (Emily Watson) incessant carping with humor and grace and who becomes both father and teacher to Liesel (Sophie Nélisse), the foster child the family shelters. In their small German town in the months leading up to World War II, he stands out because of his stance against the Nazis. He refuses to join the Nazi Party or distance himself from the Jews that remain in town. A painter be trade, he is mostly unemployed, except for the occasional odd job. The lens that The Book Thief applies to everyday people was one of the things that appealed to Rush. This is not Schindler’s List or Defiance. There are no grand heroics in this drama, only small gestures in a town that maintains the party line as Germany rushes toward world war and holocaust.